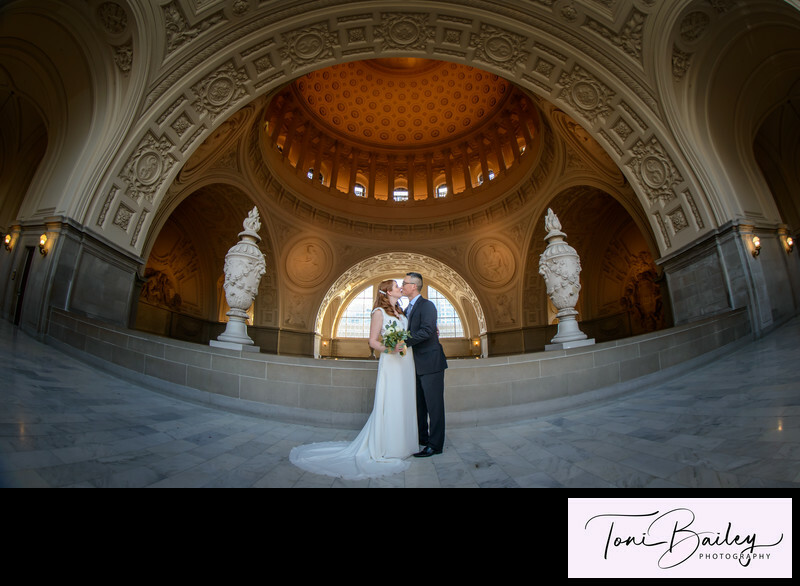 With over 300 marriages creatively photographed at this beautiful SF location, we have learned a few important things that will definitely help the day go more smoothly. The following list is not all inclusive, but features many of the things that have affected our engaged couples the most before the wedding. Weddings here are on a tight schedule. San Francisco is famous for delaying people trying to make it across town and there is always the possibility of a large event happening close by which can either back up traffic or close the parking garage. Even the security check-in point can be backed up. So allow extra time to enjoy the historical information located all around the building. Or have some coffee at the Mint Cafe downstairs while you wait. You will be happy you did. The City Hall County Clerk's office will not allow you to get married if you present expired ID's. Whether you are using a Passport, Drivers License or other form of identification, the dates have to be current. If you have doubts about your documentation, obtain your City Hall marriage license the day before your ceremony. This way if there are any problems you will have time to fix them. You will be provided with documents that you will want to protect, especially your souvenir marriage certificate. This is something you will want to keep nice! For extra protection, place a bit of cardboard in the envelope to keep it from bending. We will help you to keep it safe during your wedding photography session. On hot summer days, the building can become very warm. If your civil ceremony is delayed for some reason, it's important to keep hydrated and fed. Water fountains are present, but you may find yourself waiting for your Deputy Marriage Commissioner to show up in an area where there are none. We always keep a fresh water bottle with us for your use as well. Dehydration is one of the main reasons people faint during ceremonies. A protein or power bar is suggested to keep you going. They are available in the Mint Cafe at City Hall if you forget to bring one. We will take you throughout the building for photos so why not be comfortable and carry some walking shoes. We provide plenty of time to change for photos! Comfy shoes will also come in handy if you decide to walk to your lunch celebration after your civil ceremony. There are a number of nice places to eat within walking distance of city hall. 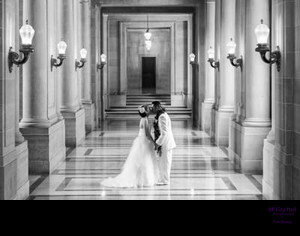 San Francisco city hall weddings can often run late. The clerk's office gets behind and events at the building can delay your ceremony. If you are planning an event after your wedding, it's best to allow plenty of cushion time. Many weddings end in the afternoon and this will put you in the middle of rush hour traffic, so be sure to account for this when planning your wedding day timeline. 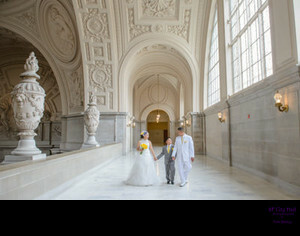 Click City Hall Weddings to return to Home Page or visit our Portfolio.